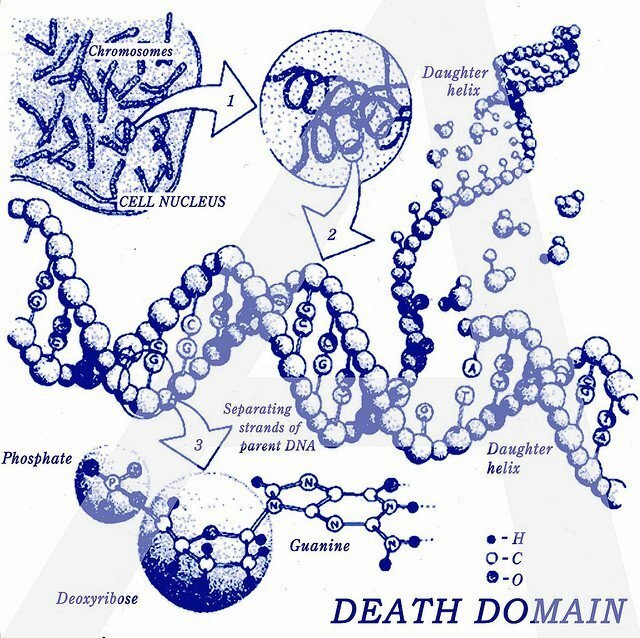 Death Domain aka Adam Stroupe is a science nerd from Baltimore and, like me, wears it as a badge of honor. His sound is undoubtedly one of the most bewildering, disorienting yet magnetic and infectious slices of downright bleak takes on synth-based dance music. A one man all-live-analog electronic ice machine (who is also behind 'SIDS' - Sudden Infant Death Syndrome). His sound is as cryptically raw as it gets - summoning the seminal Industrial/EBM sounds of the likes of early Cabaret Voltaire, Skinny Puppy, and The Normal. Each 7" jacket is silk screened with 4 possible covers that feature a different glow-in-the-dark letter corresponding to base pairs of DNA: A,C,T,or G. Also included are 2 postcards with lyrics and scientific drawings for those without an imagination.